The relationship that someone has with their healthcare providers is far more important and intimate than the relationships they may have with other service providers or merchants. But healthcare is a business after all and a competitive one at that. Just like any other business owner, providers need to think about how to attract and retain patients. Weatherby Healthcare recently published the results of a study which looked into the factors that patients consider when choosing a healthcare provider or deciding to switch. This data provides some good guidance for practices that want to increase patient retention. Here are a few of the most important lessons. Even patients who are otherwise happy with their care, report being dissatisfied with the amount of time they have to see the doctor. Ironically, most of this waiting doesn’t happen in the waiting room. Patients reported spending nearly 29% of their time in the exam room waiting for the provider. What can practices do about wait times? First, if you are setting a baseline for improvement, measure the wait time from the time of the appointment to the time that the patient sees the provider, not the time they are brought into an exam room. Next, schedule wisely and allow enough time for each visit. Finally, consider the use of telehealth technologies that allow some visits to be completed remotely. These visits take less time and help keep the pace of patients in the office moving smoothly. Even in this day and age of data-driven decisions and a more process-driven approach to healthcare, people care about the temperament of their healthcare provider. The survey found that nearly a quarter of patients would consider switching to a physician with a more positive attitude. We don’t need to tell readers of this blog that providing excellent patient care while making great business decisions for the practice can be stressful. This stress can become apparent, especially when the provider is running behind. A reasonable work/life balance is essential for healthcare providers and an important way to maintain the upbeat outlook that patients desire. If your building hasn’t been updated since the 1970’s, patients might assume that your knowledge hasn’t been either. Patients, especially women (78%), care about the design, cleanliness, and comfort of the facility in which their physician practices. Providers with clean, modern facilities and the latest health information technology and equipment are perceived as more competent and up-to-date with their skills. Fully 70% of those surveyed said that the convenience of the location is a very important or critical factor in selecting a provider or deciding to switch. This is probably one of the most important bits of information in the survey. Why? Because today’s practices are facing increasing competition from providers located in the most convenient place in the world – wherever the patient happens to be. Online only providers are popping up to offer video visits from any connected device. Patients don’t have to take time off of work, spend time in traffic, or figure out what to do with the kids. Of course, not every case is appropriately handled via video, but many issues can be safely, effectively, and quickly resolved in this manner. 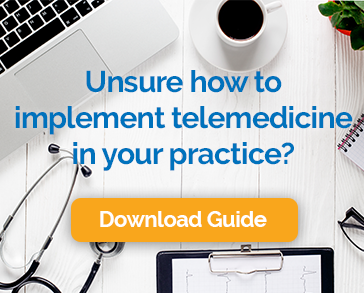 Providers looking to protect against this new type of competition should consider a telemedicine program that lets the patient get the convenience they crave from the provider they already know and trust. Overall, the study found good news. Approximately 75% of patients are satisfied with their provider. People generally believe they are getting good care, but they also want providers who are respectful of their time by paying attention to wait times. They care very much about convenience, and they reward providers who keep up with the latest treatment options and technology with continued loyalty. In the face of increased competition and new options for patients, providers should keep these priorities in mind.